There are posters all over town advertising the Royal Shakespeare Company’s current production of The Tempest. I would see them in the subway or on the sides of buses and think, “Oh, I should see that” only to forget all about it when I was back at my computer and able to do something about it. Until yesterday. In the middle of the afternoon it occurred to me that I should get out and see something (after all, I’d run out of episodes of Orphan Black on Netflix). I remembered The Tempest, found a perfect seat just waiting for me, and purchased it. A few hours later I discovered that like a Michelin-starred restaurant, the theatre was impossible to find! 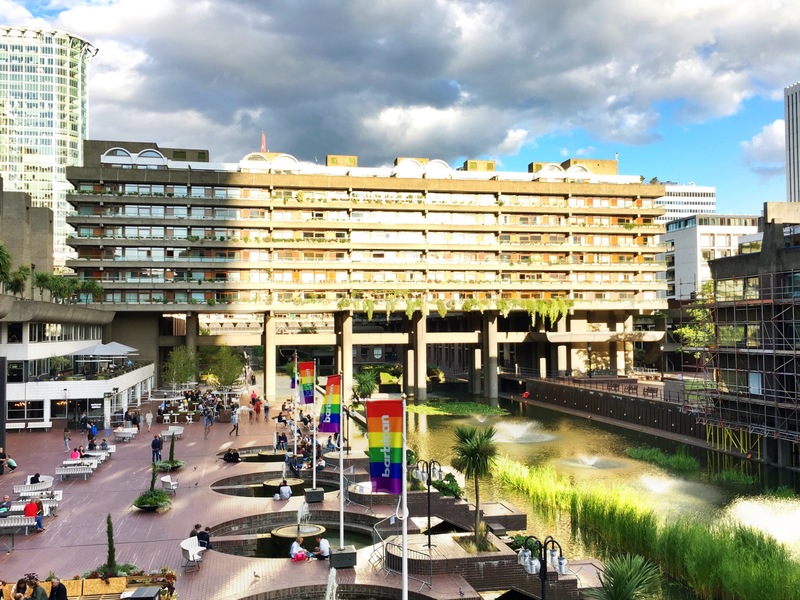 I knew it was inside the Barbican Centre, which itself was buried inside the Barbican Estate, which I only knew as a rather forbidding brutalist residential complex across the street from my office. What I hadn’t appreciated is just how much of a different world the complex was. 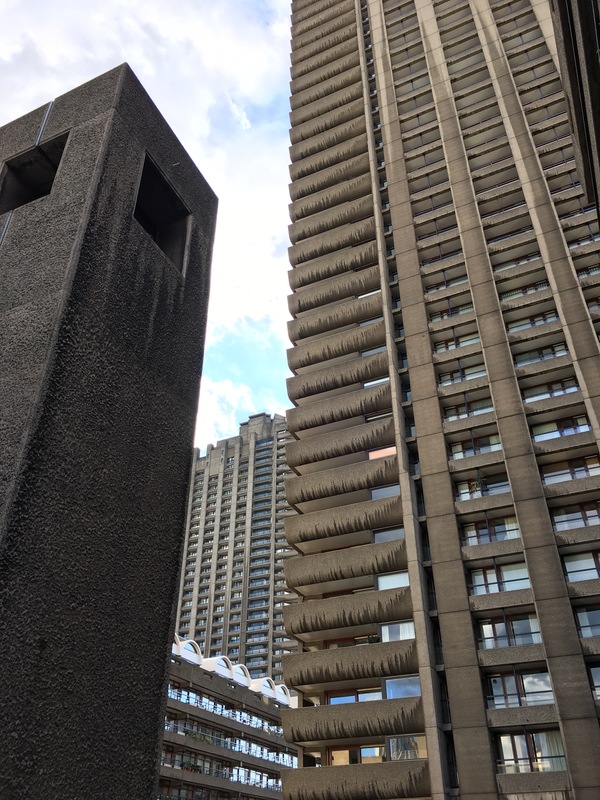 I’ve never been a huge fan of brutalism (an architectural movement in the 1960-70s that got its name from its heavy use of “brute” concrete but also seems to embody the notion that architecture should be as harsh and ugly as Cold War life could be). Only as I wandered through the complex in search of the theatre, I found a deepening appreciation for the style growing on me. Sure I was surrounded by unforgiving concrete towers, but the scale of the unrelenting geometry was impressive . . .
. . . and between the towers, well hidden from outsiders’ views, were lovely oases of green with gardens and flowing water that softened the concrete world. I made a mental note to come back sometime and explore when I wasn’t worried about finding the ticket office in time for the show to start. 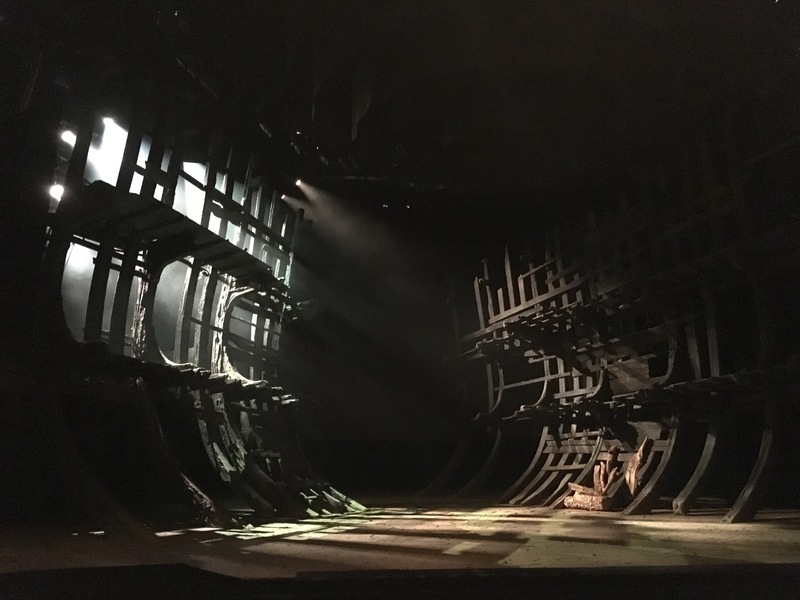 Fortunately I did find the ticket office and soon found myself sitting in front of a wrecked hull of a ship, where for the next couple of hours I saw the fantastical tale of revenge, forgiveness, love, magic, power (political, magical, poetical), and the desire to be free. Simon Russell Beale, who is one of my favorites, was a moving and sympathetic Prospero. Miranda suffered from what I call Shakespeare Syndrome, with everything she said feeling slightly overwrought. And Ariel was an interesting mix of human and technology — he was fitted out with body motion sensors so that his magical apparitions could appear as projections that moved as the actor moved his body. The effect was alternately stunning and clunky. My only real complaint of the evening was against the American man sitting directly behind me. Not only did he insist upon too loudly recounting his life story to his neighbor (he’s a scientist from Northwestern, in town for a conference at Cambridge, and a huge fan of the Barbican theatre) and rapturously gasping and moaning at every familiar line in the play, but he did so WHILE ALSO EATING PEANUTS!! Seriously. Lest there be any doubt, as far as cardinal sins go, peanut breath in a theatre is second only to Dorito breath in a bus. I literally lol-ed at the peanut breath! Somehow it seems fitting.